Not often a family favourite, this delicious brussels sprouts recipe will help convert reluctant guests, with a modern take on this traditional side dish. A perfect accompaniment to a tasty roast. 2) Put a large roasting tin in the oven to heat. 3) Trim and remove the outer leaves from your sprouts, leave them whole if they are small or halve or quarter them depending on size. 4) Peel and thinly slice the onion. 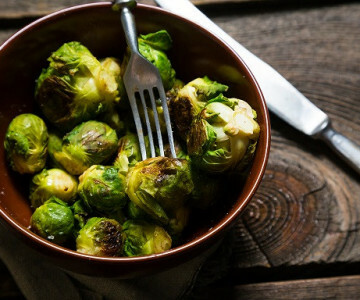 5) Mix the sprouts and onion in a bowl with a good squeeze of lemon juice, a generous pinch of salt and pepper, a few thyme sprigs and a drizzle of olive oil. 6) Mix well and set aside for the flavours to marinate. Tumble everything onto the warmed roasting tray. 7) Roast for 15-20 minutes or until tender and a little crisp around the edges. Finish with a grating of lemon zest, a little more pepper and then the freshly grated Parmesan.